As people began to travel the globe they directly and indirectly moved plant and animal species from their native habitat to new, often distant, locations. With the ease of global travel this phenomenon has been accelerated over the past twenty years. Initially there was little knowledge or concern about the long range implication to local ecosystems. Unfortunately as non-native species thrive in new locations without a natural system of checks and balances the unintended consequences are often dramatic and devastating. 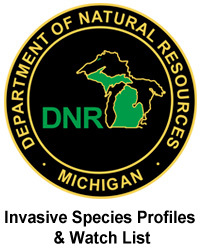 Environmental organizations and governmental agencies are now working to mitigate the negative effects of existing invasive species and proactively address new threats as early as possible. The Board of the Big Whitefish Lake Association supervises the process of treating existing invasive species with professional guidance. The BWLA Ecology Committee members assist the BWLA efforts by keeping abreast of current issues and activities regarding existing and pending invasive species. See the links below to learn more about organizations working to address these problems as well as how to support these efforts to maintain a healthy natural environment in the beautiful state of Michigan. Contact a member if the Ecology Committee if you have concerns or questions.